What color spectrum are you going for? RGB's on there I suppose? The white LEDs are "6000 to 6500K", so I expect they will be warmer than cool white, not as blue, but still typical LED spectrum. In addition I will have 2 rows of SMD 5050 that use 4 or 5 660nm red LEDs to 1 blue (near 400 nm), so they are sold for horticultural use - growing pot I suspect. I'm hoping this will give me good reds so both fish and plants will show off their red colors very well. I will have 8 rows of the white, and two rows of the horticultural LEDs. Since the 5050 LEDs give about half the intensity of the 5630 whites, so the two rows should give about 10% of the total intensity. I have never tried the horticultural LEDs before, so I will see the result only after I get it all assembled. I'm using one 12 VDC power supply, with 8 amp rating, to drive all of the LEDs - all of the individual LEDs will be in parallel. I probably won't do a tank journal. My goal is to have the light suspended about a foot above the tank, and get about 55-60 PAR light intensity. It looks more likely that I will get the PAR, but with the light only a couple of inches above the tank. The light fixture is now attached to the drawer slide, which is attached to the post which will soon be attached to the tank stand. I have almost zero extra clearance behind the tank for this. EDIT: After playing around a bit with this I find that the support "pole" attachment to the heatsink isn't stiff enough. The heatsink can move too easily in a rotary way and in a tipping up and down of the ends of it. So, it is back partly disassembled again and some stiffening of that joint is being added. It did look like this would be a problem, but I thought it was just stiff enough. Last edited by hoppycalif; 10-05-2017 at 07:15 PM..
At 3:00 am this morning, my brain woke me up shouting "you can't do that, it won't work!" My brain apparently was working all night on this project, and glommed onto the idea that I was going to put the power cable inside that aluminum tube. The reason it won't work is that wire is rated for current carrying capability based on being in the open air so it is air cooled. Once you bury the wire inside a tube of any kind it loses that air cooling, and you need a much larger diameter wire to carry the same current. If you are using 120VAC power the current per watt is one tenth of what it is when you are using 12VDC, as I am. So, yes a 120VAC wire can be inside a tube with little problem, if any, but with 12VDC you run into overheating problems. The wire insulation would be overheated, the insulation would get hard and crack, and the voltage loss due to the wire resistance would drop the voltage at the LEDs by too much. If I try to use larger diameter wire I won't be able to ever get it through all of the bends in the path to the LEDs, a very hard job in any case. So, I have to run the power cable outside of the support tube. I wish I had thought of this sooner. I gave my brain a severe talking to!! Behold the power of the subconscious! A few years ago I made a different type of light using SMD5630 LEDs, and got a lot of data on how much PAR they produce. I used that data to predict what this light will produce, at the 30 inch distance I want to use it for. 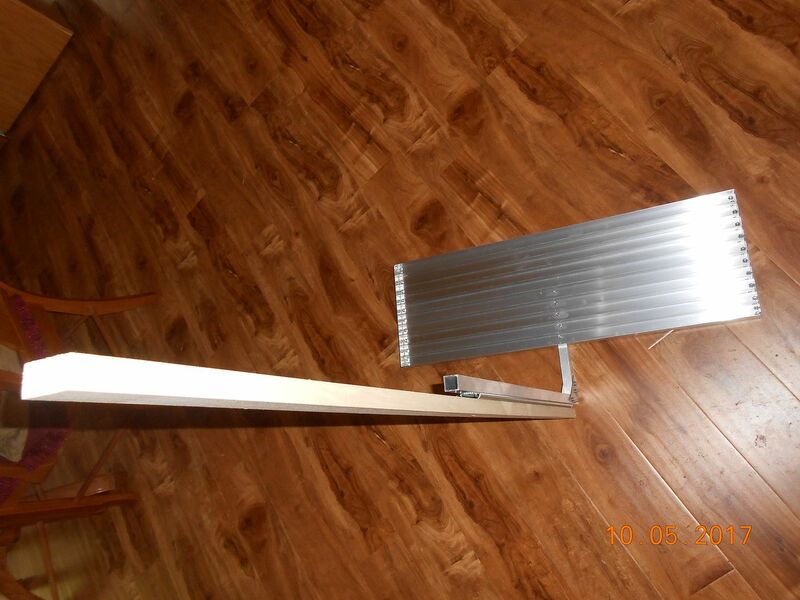 That other light used 24 inch long strips of LEDs, while this one will use 30 inch long strips. 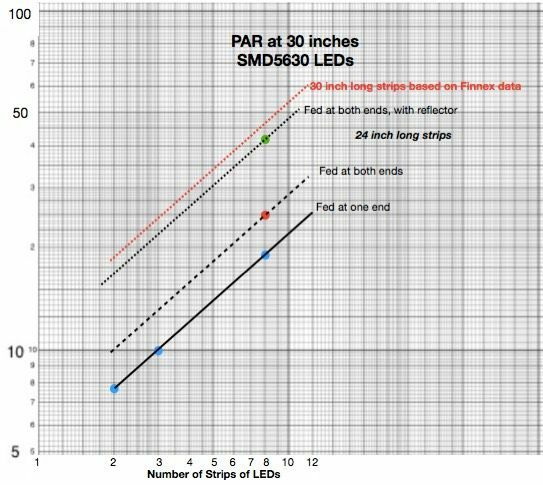 We have Finnex data showing that longer strips of LEDs produce more PAR than shorter ones do. Using that data, very conservatively, I adjusted this projection for the longer strips. It looks like I should get about 50-55 PAR, which was my goal. It will need 10 rows of LEDs instead of 8, but I have enough room and LED strips to do that. Of course the proof will be when I finally get this done! Thanks for updating so frequently! I just cant wait to see it done! I'm all about end results. Nice graph btw.